Finally finished the last of my handmade gifts for this holiday. Whew! It's a Bucket of Love for my husband. This idea started in November of 2007. I was going to make a daily calendar for Christmas with each day stating something I loved about him. Well... that idea turned out to be more than I could take on (365 is a lot to think of, not too mention making the calendar!). So, I shelved the idea for last Christmas, tweaked it a bit and came up the "Bucket of Love" for this Christmas. The Bucket of Love ready to give. The idea for the paper fortune cookies came from the For the Love of Paper blog, click here to see how they're made. I printed the "loved things" on the paper directly (not a fortune slip), cut out the 3" circles (bigger would have been better) and folded them. I had a heck of time keeping the cookies from popping open (even with permanent sticky). I ended up heavily creasing the fold. They don't look near as nice as Kimberly's, but I was running out of time! I put them in a clear paint can/bucket from the Container Store, made a label for each side of the bucket and voila, I was done. 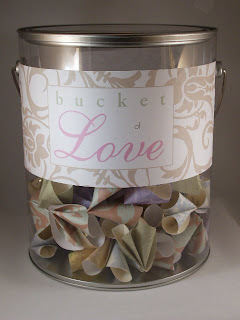 A Bucket of Love for my Love Bucket! I wonder if he will read them all at once or spread his reading out over time? Either way, I hope he will feel the love.